Albuquerque: University of New Mexico Press, 1982. 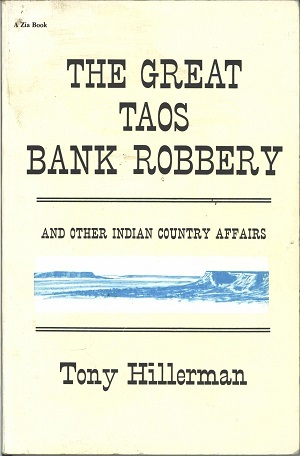 This is the second paperback printing of The Great Taos Bank Robbery and Other Indian Country Affairs. This 1980 edition was printed by the University of New Mexico Press in Albuquerque, New Mexico. The cover art features a Southwestern landscape and was illustrated by Dan Stouffer. Format: Paperback, 20.3 x 13.2 cm. Binding: Full-colored paper covers with the image of a zia sun, the author, the title, and the publisher printed in black on the spine.